Smart light bulbs that store your WiFi password are kind of problematic. When you throw it out it still remembers that password and other people may be able to retrieve it. Obviously that isn't ideal, but that's a symptom of a bigger problem. 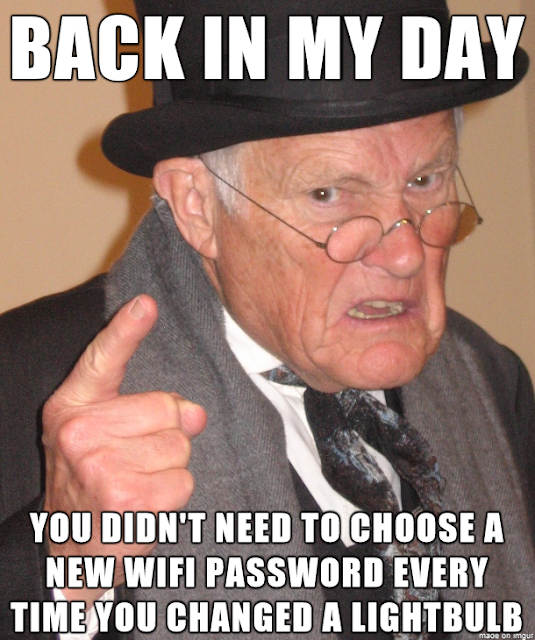 Many (maybe all) smart devices are going to remember your WiFi password and we are introducing them into an established culture of disposable consumerism, where old things are regularly thrown out and replaced with new ones. I freely admit that I never really appreciated the problem of security waste (forget e-waste, now we'll have s-waste) before, but as more and more things become smart, our garbage will contain more and more of our passwords. That's a disturbing attack surface. I don't know if we're really ready for the consequences of the Internet of Disposable Things.